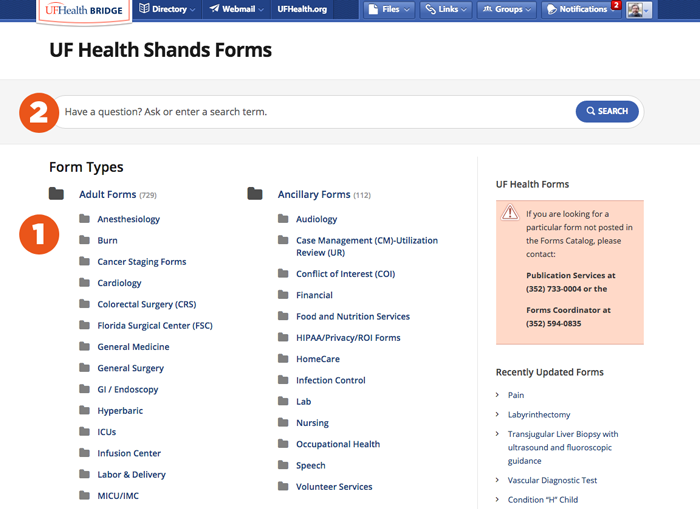 One of the most heavily used sections of the UF Health Bridge is the Forms Catalog, which is a searchable database for downloading or ordering the forms managed by Publication Services, including clinical care forms. 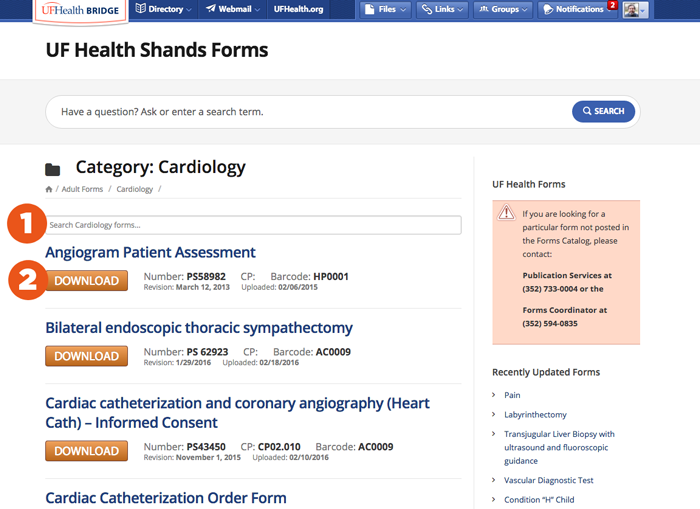 Based on feedback received from staff, observed use of the site, and the Publication Services team, Web Services has made some changes to the catalog to make searching for forms easier. From the home page, forms are grouped into category folders based on the type of form and then by associated service line. You can search for any form by name or by its Publication Services (PS) number using the search bar at the top of the page under the title. As you type the name of a form or its number, an autocomplete box will show you results that match your search under the search bar – you can click on the name to go to the form. This is a typical category page. Under the category name, we can see where this folder is in relation to the catalog with a breadcrumb trail: This is the Cardiology folder within Adult Forms. We’ve added a second search filter to the site which will allow you to limit your search to just this category folder. 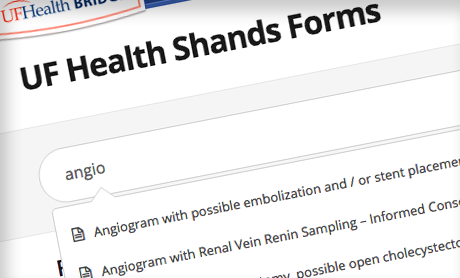 The top[ search feature searches all of the catalog – this one will just look for forms specific to the Cardiology. As you enter a form title, the results listed below will change to show only forms that match that name. The order of forms has been changed to display in alphabetical order. 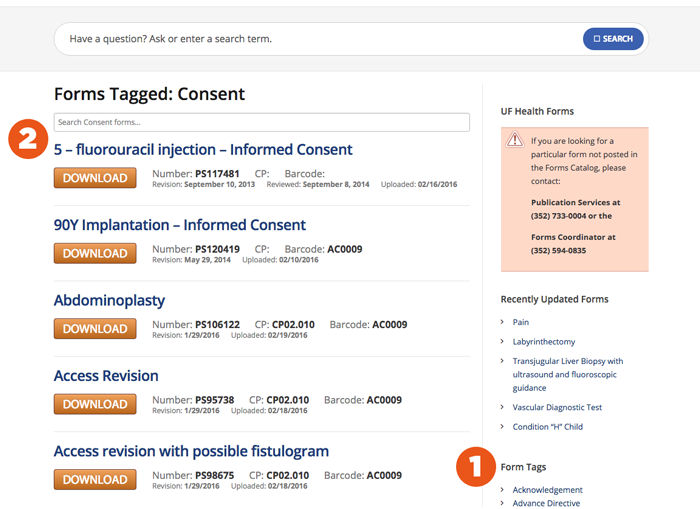 Sometimes you’ll be looking for a form not by service line or by its category, but by the purpose of the form – for example, a consent form or an assessment form. To allow you to search by this, we add tags to forms that allow us to index them by their purpose. In the screenshot above, we’ve scrolled down the page a little so you can see the Form Tags list in the right hand column. This is a full list of all the tags currently being used for forms. Clicking on a tag title will take you for an index of all the forms with that tag. Like the category page, these forms are listed in alphabetical order and can be filtered using the filter field. The results on this page display forms from multiple service lines. If you are ever unsure if a particular forms is relevant to your department, look under the tag list for the form. The Service line folders will be displayed here. Adult Forms. If the form was used by multiple service lines, each of them would be represented here. A full overview on the Forms Catalog can be found in the Bridge’s help and how-to section. Web Services values your insights and opinions to help make our products more useful to the community. If you have more questions or suggestions for improving the forms catalog, Bridge, or any of our other web properties please contact us. We look forward to hearing from you.